Google Public Policy Blog: Which blogs does Canada’s next Prime Minister read? Which blogs does Canada’s next Prime Minister read? During this federal election campaign in Canada, the leaders of four of Canada’s political parties – Stephen Harper, Stéphane Dion, Jack Layton and Elizabeth May – are giving users an insight into how they use blogs, news sites and other online sources to stay informed. Along with leading Canadian journalists they are using Google Reader to share and comment on new items, opinion pieces and blog postings. We worked closely with leading Conservative blogger Stephen Taylor to make this happen. 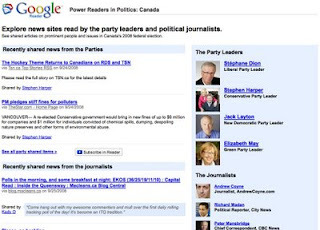 Go to www.google.ca/powerreaders and click to subscribe to your favourite Power Reader’s feed – or subscribe to them all. Combined with Canadian Edition of Google In Quotes and the Canadian Election section in Google News, Canadians have amazing tools to harness the power of the social web to better inform themselves on the issues and decide among the candidates. Don’t forget to vote on October 14!